Yesterday, the parliamentary opposition United National Movement (UNM) revealed its top ten people on the election list for the October parliamentary race. The list completely matched the list revealed by Georgia’s private broadcaster Rustavi 2 several days ago. Davit Bakradze, one of the most prominent faces of the party, was named as number one on the list. The following positions were occupied by UNM members, former officials and experts. Sergo Ratiani - UNM lawmaker. 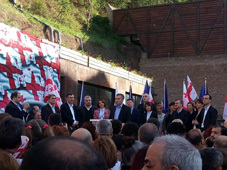 In his speech Bakradze said that Georgia required the “right vision, high-competence and renewed energy”, which would all be ensured by the UNM. 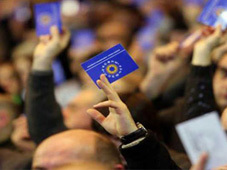 “We have presented the renewed team and the team with its right vision, new energy, past experience and knowledge will take the country out of the existing economic crisis,” Bakradze said and promised the UNM party list would include some other new faces. A representative of the ruling Georgian Dream (GD) coalition said the renewed team would not help the UNM to win the race as people already accumulated a very negative attitude towards the party.